Letters from Backstage: Adrienne Bell-Koch – Front Row Theatre Co.
We are so excited to be working on our fall show, The Shadow Box! To celebrate, we’re kicking off a new series of posts to give you a sneak peek into our weird and wonderful world of theatre. Today we hear from Adrienne Bell-Koch, our set designer and Front Row’s technical director! I’m the set designer, and tech director, for FTC. 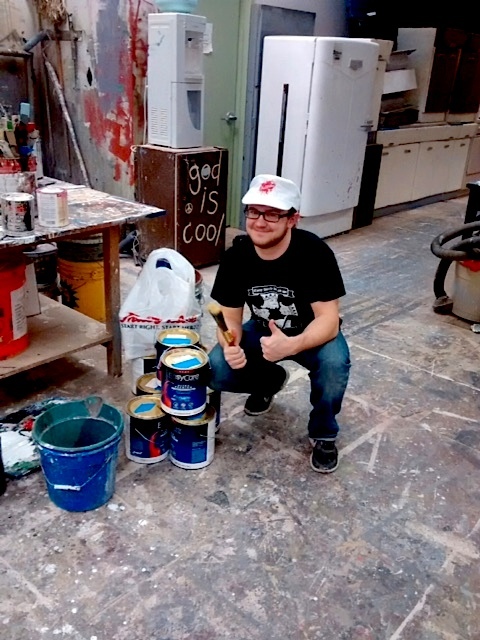 I want to tell you about a day in the life of a set designer, and, by extension, a day in the life of my master carpenter, Carson, because I couldn’t get through it without him. At 5:15 pm last Wednesday we arrived at Monarch Hardware, the local family owned hardware store. We poured over paint chips and colors. We had talked about the color scheme before coming but handling and seeing all the colors side-by-side always changes your original ideas a little! We ended up b.s.-ing with one of the owners while he mixed the paint colors. We came out under budget even after buying additional supplies such as brushes and rollers! At the PAC shop, we opened up the colors and tested them out. Unfortunately, they always look a little different than you think they will at first. But overall we were really happy with them. At 7, our crew of four came (right on time!) and we explained the plan for the day. I showed them the final set design and explained the colors. Together, Carson and I taught them the basics of painting and they quickly and enthusiastically got to work! They also learned how to work efficiently as a team. We had fun, but we were also so efficient that we finished in half the time we had planned. Carson and I decided the best course of action was to let the crew have a break while we mixed a new color for the kitchen walls. 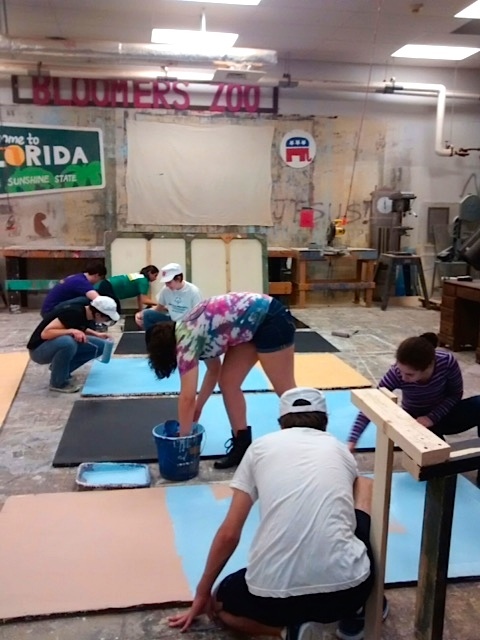 When they returned, their energy was restored, and they got the walls painted in 30 minutes! The best part of the day was remembering why I love working in the shop. The community that is created when you are all working together towards a common goal is a unique and invigorating experience. I have held roles at all levels of the set “hierarchy” (MC, set crew, and now designer) but I have honestly enjoyed every experience, and the challenges inherent in them, wholeheartedly. There is a reason I basically live in the shop. Come see The Shadow Box on November 6-8! Stay tuned for more updates as we get this show on the road!